Leave everyday life behind and immerse yourself in the easy-going life of the western Caribbean. Be inspired by nature&apos;s contrasts, seas of vibrantly coloured flowers and jagged rocky coastlines - by endless snow-white sandy beaches and roaring waterfalls. 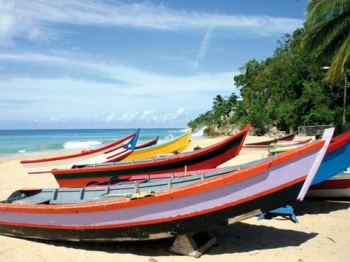 A Caribbean cruise in the western region will let you in on this exotic world. The western Caribbean lies to the north of the Equator and was named after the Carib people. The principal languages, alongside French and Dutch, are Spanish and English. The best time for a Caribbean cruise is between December and May. The Bahamas - let yourself in for riveting adventures, such as feeding alligators, while at the same time enjoying the languor of beaches lapped by turquoise waters right out of paradise. Discover the many facets of the independent island state of Jamaica with her Blue Mountains that tower up to a height of 2200 metres, the near-deserts in the south and the lush, dark-green north. Let your Western Caribbean Cruise take you to Haiti, the country which occupies the western half of the island of Hispanola. The ruins of the Sans Souci palace will take you back into Haiti&apos;s history. The Macaya National Park, with its wild beaches, will leave you with impressions rich in contrast. The Cayman Islands are an equally popular destination for cruise ships. The island&apos;s freedom from taxation has made its capital, George Town, into one of the world&apos;s most important financial centres. At the same time, the gigantic coral banks and wonderful beaches ensure that no watersports enthusiast or sun worshipper need go away disappointed.